You can manifest love with the specific person that you want, if you deeply believe you can be with him or her. When you completely believe you can be with the person, you will be a vibrational match to your desire. Make sure you understand what I just said: You're goal is to be a vibrational match to your desire, not a specific person. Your aren't looking to manifest a specific person. You're looking to manifest a relationship with a specific person. The relationship is your desire, not the person. So how do you become a vibrational match to your desire? Start by becoming quiet and focusing within. Concentrate on what it would be like to be in a relationship with this person. Are you tense, worried, afraid or doubtful? If you feel anything less than good, you are not a vibrational match to your desire. You are actually blocking it. You need to let these lower vibrational energies go. Release the tension, fear and doubt. Only think about the other person if it feels good. If it ever feels bad, think about something else. If you think about the person when it feels bad, you are creating instances where you are a vibrational match to not being with him or her. Don't worry about whether or not he/she is interested in you or out with someone else. When you do so, you’re observing the absence of the love relationship. You’re so aware of your current relationship and lack thereof, that you’re keeping yourself separate from the relationship you do want. When you start thinking about how you're not with your specific person, stop and focus instead on feeling good. Release all thoughts of the other person. This will allow things to flow again and begin to move you towards the relationship you desire. Stop trying so hard. Stop trying to get away from where you are now. You have to focus on yourself and make your relationship with yourself a priority. When you do that, everything else will fall into place. If you want more information on manifesting love with a specific person, check out the pages below. Can I follow the same steps to manifest friendship with a specific person? I would love to get to know them as we have similar interests and both share the same passion but live two very different lifestyles which is why I have never approached them. But I suppose if you can manifest love than manifesting friendship should be just as easy, right? 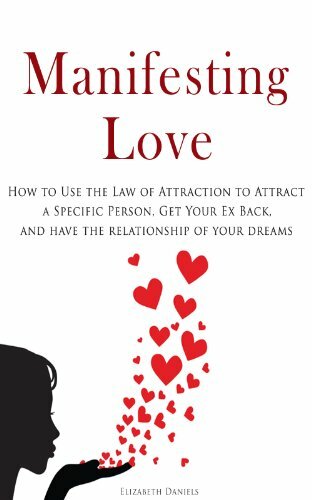 I think you could certainly use the steps in Elizabeth’s book on manifesting love with a specific person. I don’t think you’d have to change the techniques at all to manifest a friendship. 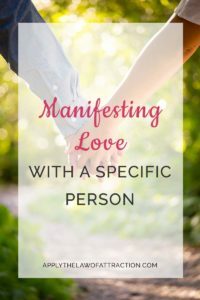 Elizabeth explains how to manifest a relationship with a specific person in her book, Manifesting Love.